My step-mom used to do a lot of craft-making. She was always working on something for every holiday that she would set around the house or hang on the tree or give as a gift. 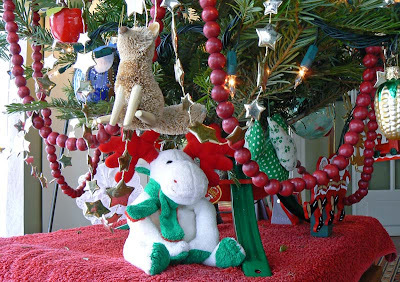 She made a lot of tree ornaments and I received a fair share of them many years ago. This is one of my favorites of hers. It's a wreath made from a lacquered wooden ring, with a tiny holiday tree in the middle embroidered on fabric and stuffed from behind to make it look like a little pillow. It's no more than three inches in diameter. It just says Christmas to me. 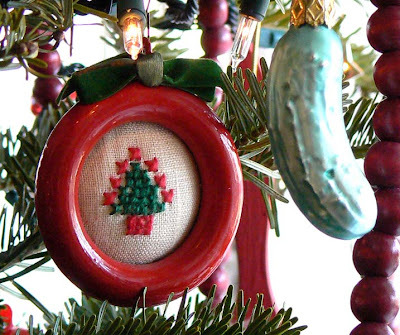 To its right is a cucumber ornament, part of a set of vegetable ornaments I found one year. I'm fond of food-related things for the tree. And there are more than one bunch-of-grapes ornaments hanging on it, too. And, while you're here, let me wish you all the best for a healthy and happy 2009. I have a self-imposed tradition. Well, I have a lot of them, but now I'm talking about one in particular. I always take the holiday tree down on New Year's Day. I just do. 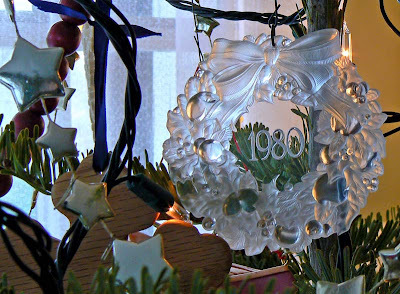 So, in honor of this year's tree and those from the past, I thought I'd highlight some of the ornaments that have graced our trees over the years. The blue bird of happiness. First up, one of my favorites. 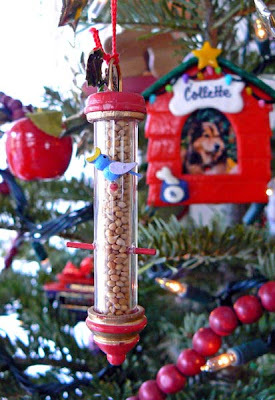 A bird feeder, filled with seed, and a little blue bird. This one always makes me smile. Behind it, on the right, is the frame our friend Sue made (or had made) in 1996 with a photo of our since departed Collette. Also visible, one of about a dozen plastic apples that I bought one year, and the wooden cranberry strings. 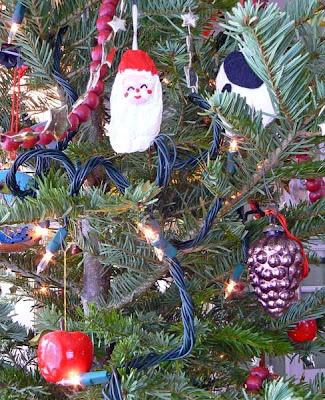 I actually used to string fresh popcorn and cranberries for the tree. After more than enough years of that I saw these wooden berries at Crate and Barrel and said what the heck. It's much less trouble. So, I know the answer to what happens to all those socks that go missing in the laundry. It's the dogs. Dogs love socks. Callie and her latest knotted sock. Callie is no exception. But I think we have her trained not to pick up just any sock in the house. In fact, we can leave our socks out waiting to be folded, and she won't go for them. 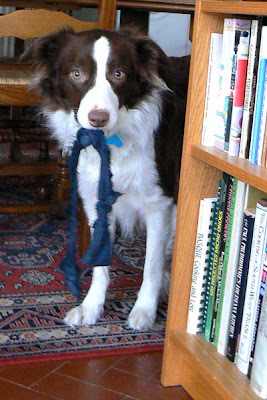 The trick was this: whenever a sock wears out, we tie a few knots in it and give it to Callie. Then we play "sock." So, for her, a sock has knots in it. Those flat things are just not interesting. Christmas day at our house was very quiet, just Ken and me and Callie. We didn't have to rush anything since there were no guests to prepare for and we had worked on as much ahead-of-time preparation as we could. First course: foie gras de canard with fig jam. Ken had mixed up the cornbread and sausage stuffing the day before and put it into the fridge so the flavors could blend. I made up the crêpes that would go into our dessert: crêpes Suzette. They went into the fridge as well. 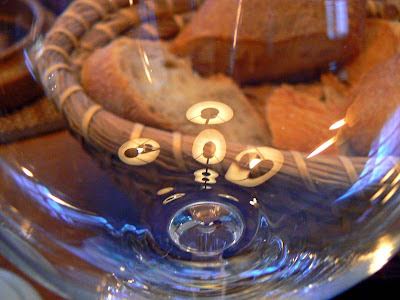 Wine from Monbazillac accompanied the duck liver. We also had a box of dried figs that had been sitting in the fridge for I won't tell you how long. Ken re-hydrated them by soaking them in leftover tea. Then he chopped them up and compoted them with some sugar, red wine, and port. He added a small amount of plum jam that had crystallized in the bottom of its jar, and an apple. 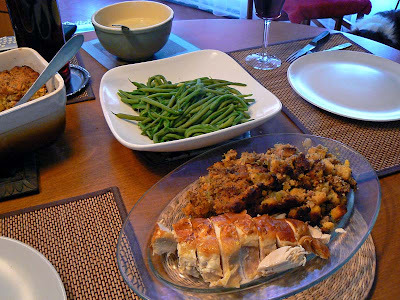 Main course: chapon, stuffing, green beans, and gravy. So, on Thursday, all we had to do was to cook the chapon (capon), bake the stuffing, and make dessert. Ken poached the chapon in broth with aromatic vegetables, then finished it in a hot oven to brown. The stuffing cooked in the oven while the bird poached. We cooked up some green beans from the garden that had been blanched and frozen last summer. 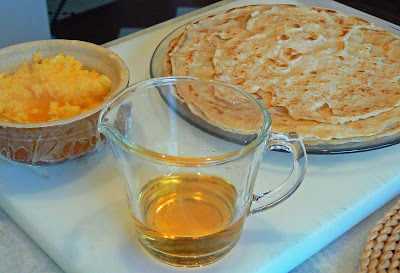 Orange liqueur and clémentines are the beginning of crêpes Suzette. 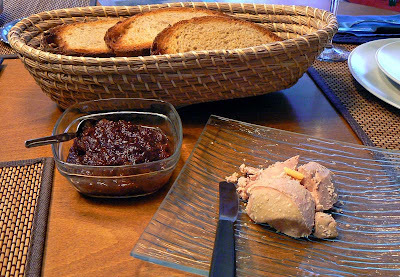 Our first course was foie gras de canard (fattened duck liver), a traditional thing to eat during the holidays. We ate it on slices of toasted pain de campagne with the fig jam on the side. 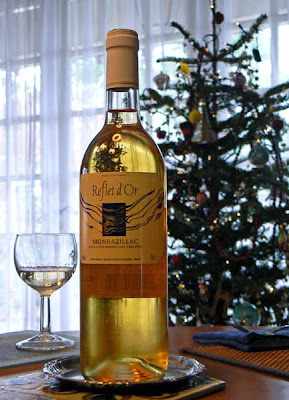 With it, we drank a sweet wine from the southwest near Bergerac called Monbazillac. Then it was on to the main course. Ken cut the breast off the bird and served it with the stuffing and a white gravy he made with the pan drippings and the poaching broth. We also ate the beans with that. We drank our local Touraine gamay red. Orange butter, crêpes, and cognac/Triple Sec at the ready. After a brief pause, it was on to dessert. Earlier in the day I made an orange butter for the crêpes Suzette. It's made with orange zest and juice, sugar, butter, and orange liqueur. 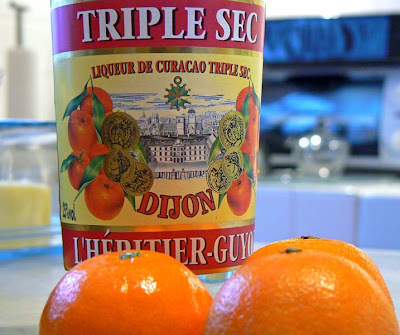 I used clémentines instead of oranges and Triple Sec instead of Grand Marnier, because, well, that's what we had in the house. The butter gets put in the pan and cooked until it becomes a syrupy sauce. Then each crêpe is coated with sauce and folded up in the pan. Finally, some cognac and Triple Sec are added and the dish is flambéed. 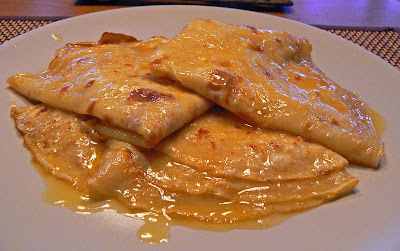 A serving of crêpes Suzette. Yum! It was very rich, very orangy, and very tasty. Boy, were we full at the end of the day. I walked a little of it off with the dog. Later, we settled on the couch in front of the fire and watched some t.v. until bed time. Now it's time to attack the leftovers! 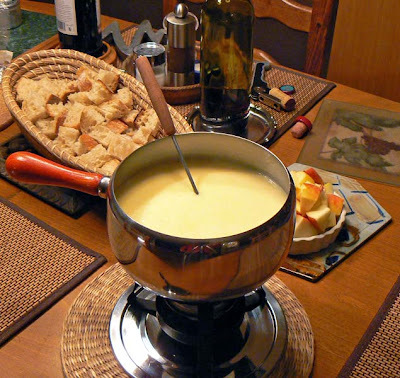 For at least ten years, maybe more, Ken and I have celebrated our réveillon de noël (Christmas Eve) with a cheese fondue. I don't know why we started doing it. I remember fondues from when I was a kid, usually beef fondues that my parents did. Sapin de noël courtesy of Charlie Brown. The week before my first-ever trip to France in 1981, a friend and I had dinner at a fondue restaurant. We started with a cheese fondue, then had a steak fondue, and finished with a chocolate fondue for dessert. It was quite decadent, but fun. Little anchovies rolled and stuffed with capers. My flat-mates and I threw a party in Paris in 1982 and served a chocolate fondue -- it was actually made with Nutella -- that was really yummy accompanied with bananas and strawberries and other fruits. 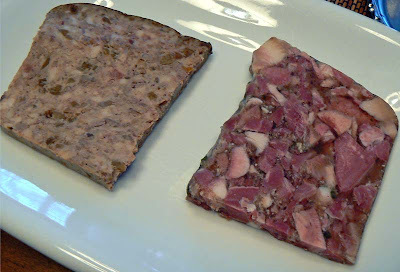 Two pâtés, pork and figs on the left, and tête de porc on the right. So I had a little experience with fondues, but it wasn't until the late 1990s that Ken and I actually did one of our own. 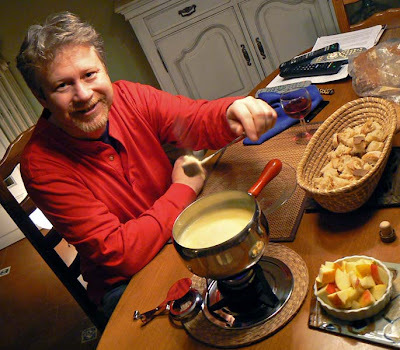 As he mentioned in his blog post the other day, Ken had a recipe for cheese fondue, called fondue savoyarde in French, that he got from a friend many years before. He dug it up and we planned our first Christmas Eve fondue. Fondue savoyarde, this year made with four cheeses. Since then we've done it every Christmas Eve and look forward to it every year. We use good bread, but it needs to be a little stale to work well, so when it's not day-old we dry it out in the oven. Sometimes we include cubes of apple and/or pear for dunking. That's me looking a bit dorky dunking my bread. The remotes didn't get dunked. 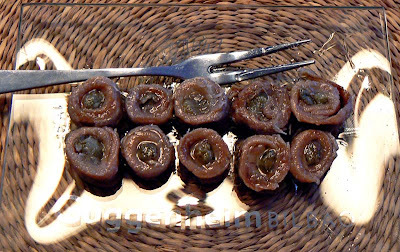 This year we had a pre-fondue snack of anchovies stuffed with capers, pâté de tête, and pâté aux figues around noon time, followed by the main event later that evening. It was a successful melt and we enjoyed it with bread and apples. We have yet to do a fondue bourguignonne (steak fondue), but one of these days I'd like to try it again. This year's Yule Log, just for you. WCS will be back after the holiday. Turn your speakers on - there's music! Here's wishing you and yours a very merry day. On Sunday we had a busy day (for us). That means that we were invited out to a party, needed to stop at a bakery for bread, and had to get home to prepare our traditional Walt's Birthday Dinner. 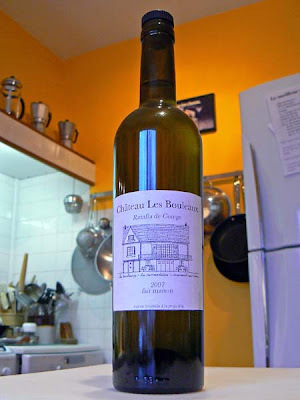 Our house label, Château les Bouleaux. I drew the little picture of our house back in 2003. Since one cannot go to a party empty-handed, we had to think of something to take to our hosts. They are a mixed couple (French man/English woman) that we see every now and then. We met them both when they were with previous partners, but there has been some shifting around and they've been together now for a few years. We could have taken flowers (boring) or chocolates, but we ended up getting a little earthenware tray. Since it was also his birthday, I wanted something a little more. So I bottled up some of the ratafia de coings (quince liqueur) that I had made last holiday season, whipped up a little label on the computer, and took that along. 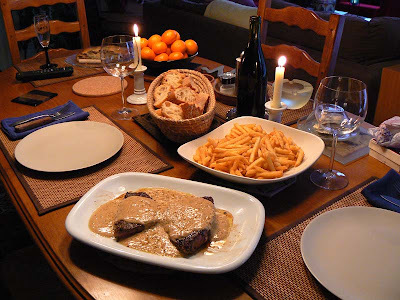 Steak au poivre and frites, the tradition continues! The party was fun, but we only stayed a couple of hours. Once home, we changed into more comfortable clothes, opened a bottle of sparkling Vouvray, and made our dinner. Very tasty, as it is every year. So I got us a little sapin de noël (christmas tree) the other day. I liken it to a little Charlie Brown tree. Small, not so pretty, but needing a home. So it has one. We didn't put up a tree last year because Callie was still a little puppy and we didn't know how she'd react to a tree in the house. So I just strung some lights on my Eiffel Tower. 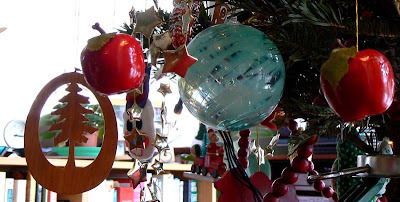 Apples, glass, and wooden ornaments. But it's time now that she learn about holiday trees. So this year I got one and put it up. She's not sure what it's all about. She sniffs the low branches, but so far doesn't seem to mind it at all. The santa was painted on an oyster shell by Ken's aunt. It's fun to get out the ornaments. They always remind us of times past, when we got them, or who gave them to us. It's nice. 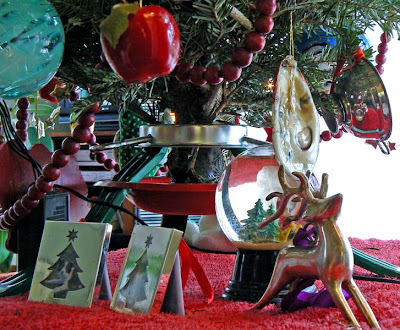 A stuffed reindeer, a wolf from Yosemite, and wooden cranberries. 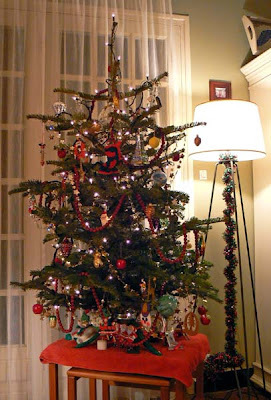 So here are a few photos of the tree and the decorations. I know you all have more important things to do this time of year than look at blogs. But if you're looking, Ken and I both wish you a healthy and happy time. 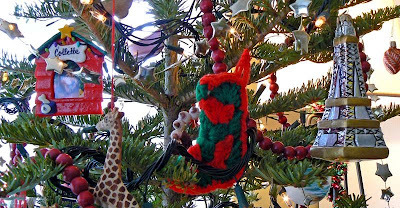 My mom knitted the stocking. The Eiffel Tower I got in SF, and our friend Sue made the frame that holds a photo of our late dog, Collette. And, if you still look later, you will see my holiday yule log, burning brightly just for you. Ho ho ho! I bought this ornament at Macy's in Albany, NY, in guess which year? Yes. I am not ashamed. It is my birthday. I'm a solstice boy. Here's a copy of a card I received from a very good friend this year. It made me smile. Birthday greetings from Lorraine and Lou. 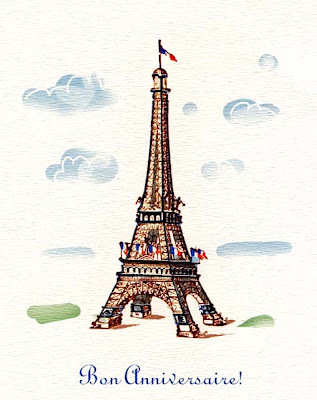 As you know, I love la tour Eiffel. Another year older, although no deeper in debt. In fact, not in debt at all. Some wisdom does come with age. Or at least a bit of luck. Yes, my friends, it is still Fall. Winter won't arrive until Sunday. Ha! Golden rotting apples cling to the tree. So, to send Fall out with a bang, or a whimper, wherever you are, I propose this. An apple tree. Leaves gone. 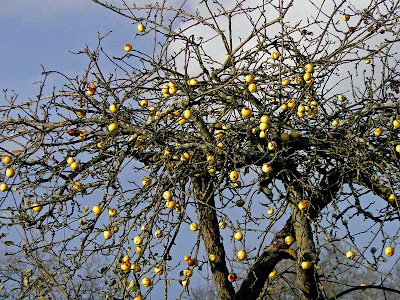 Abandoned fruit still clinging, however tenuously, to the branches. This lovely specimen is just outside our back gate. We have one just like it inside our yard. There is at least a wheelbarrow load of fallen apples under our tree that we have yet to pick up. Don't tell anyone, OK? 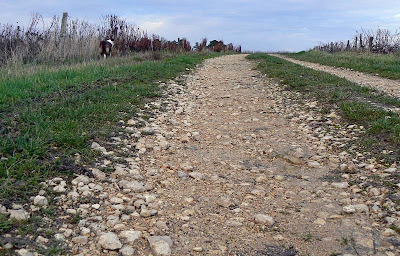 This is the vineyard road out behind our house during a recent walk. When it rains a lot, it can develop some pretty deep gullies. The rocky road. That's Callie on the upper left. Wednesday was a day full of errands. First, I had a doctor's appointment in the morning. I waited in the waiting room for more time than I spent with the doctor. Typical, but he's a real low-key guy and nice, so it really doesn't bother me. Next, I had to go to the pharmacy to refill prescriptions. On the way, I stopped and picked up a little christmas tree. Then Ken and I drove up to Blois for an appointment at the Assurance Maladie (health insurance) office, where they administer the universal health care program. We have to renew our coverage each year and they asked for some new stuff this time that we didn't understand. It turns out that, since we live in the same house, we have to be covered together rather than individually. Who knew? Since we originally enrolled separately, they were kind of confused when they realized we live in the same house. We were so lucky; the woman we met with was incredibly nice and patient and really explained things well. She said they needed to re-establish our accounts which meant new copies of all the paperwork we had already submitted (ah - bureaucracy!). We had most of the paperwork we needed with us and she seemed really glad that we didn't come empty-handed. Still, we have a few more papers to gather and submit so they can change our accounts around and square everything away. Once again I feel fortunate that we speak French. This kind of thing would be so difficult without a good knowledge of the language, especially vocabulary and expressions related to income and income tax, retirement pensions, general banking, and, of course, health care. We got along very well with the young lady we met with and we were all laughing and joking at various points during our hour-long meeting. I have a feeling that we aren't the variety of immigrants they're used to dealing with at the Sécu. Good for us. Our friends Peter and Jill Hertzmann visited us in September. This is the third or fourth time Peter's been to visit us in France. We enjoy his visits because he likes to cook, he's really good at it, and he always offers to make a meal while he's here. Our new Victorinox chef's knife. The blade's about 26 cm long, a little over 10 inches. Peter has become an expert on la cuisine française in recent years. 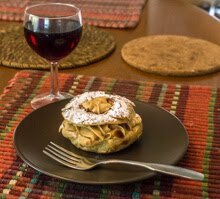 He shifted to French food after spending many years focused on Asian cuisine. He says he had a food epiphany on his first trip to Paris. A close up of the blade. "Inox" is French for stainless steel. Peter is a perfectionist. He insists on quality ingredients, precise measures (when called for), and the right tools for the job. He's teased us on many occasions about the sharpness of our kitchen knives, for example. As in they're not. Sharp, that is. The Ozitech honer/sharpener. It has "diamond fingers!" Peter swears by it. He notes that you cannot have a good knife technique if you don't have a good knife. And to say that Peter has written the book on knife technique is no exaggeration. His book, Knife Skills Illustrated, has recently been published, and he's done a round of interviews and talk shows (including a guest spot on Martha Stewart's show) to promote it. He told us about the knives he uses, made by Victorinox, and that they're not fancy and not expensive, but that they are good quality knives for home use. We looked them up on the web while he was here and he showed us several options for our needs. I told him I'd think about replacing our knives in the months to come. Well, imagine our surprise when, one day a few weeks ago, a package arrived in the mail from Peter. It was the very knife we had looked at online, along with a honer/sharpener to keep it in tip-top shape. 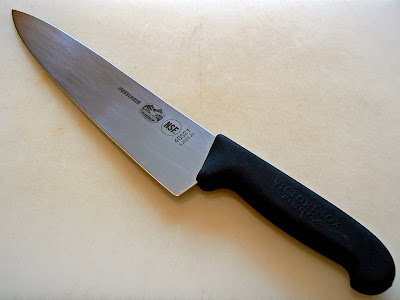 Peter said that he's looking forward to using a sharp knife the next time he visits. In the meantime, we are certainly enjoying it. It makes an incredible difference. Thanks, Peter! If you haven't already, check out Peter's web site, à la carte. It's full of interesting stories and recipes. 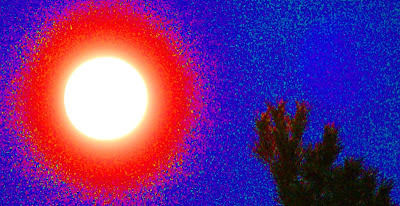 Last Friday there was a full moon (that might explain some things...). As it rose in the north-northeast I grabbed the camera and the tripod and went out on the deck. It was cold. But for some reason the photos did not come out as I intended. Again, I'm not too patient with the settings when it's cold outside. So I took what I got and Photoshopped the heck out of it to come up with this. 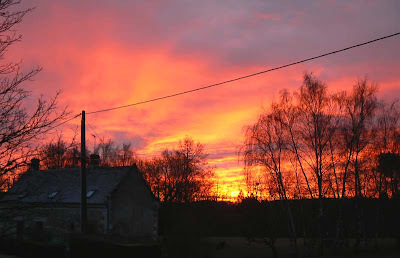 Here's a look out the kitchen window on Saturday morning at sunrise. A weather system was moving in and these clouds were the advance forces. View from the kitchen with our neighbor's house across the street. The rain began mid-morning and there's a chance of it turning to snow sometime on Sunday. We shall see. **UPDATE - no chance of snow reported now. It warmed up a bit. 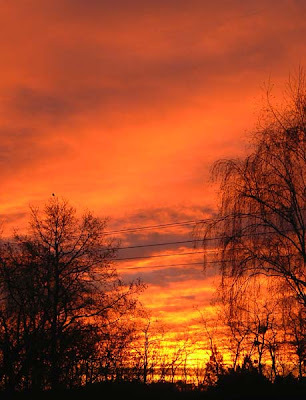 These colors only last a few seconds while the sun is below cloud level. After that, the sky goes back to gray. Althéa is one of the common names for hibiscus syriacus. The flowers look like hibiscus, only smaller. I learned about this plant only after moving to France. 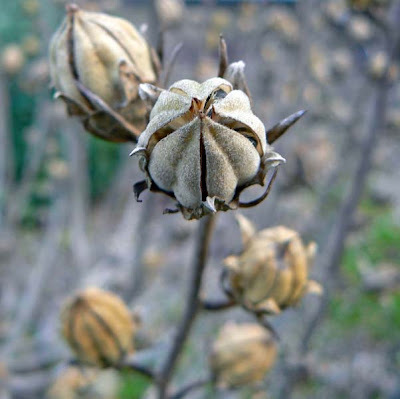 The seed pods of a neighbor's althéa. We have one in our yard, although like many plants in our yard, it was put in the wrong place. It's currently growing, or surviving, under the canopy of a weeping birch. These plants prefer full sun. There were two others in the yard that I cut down because they, too, were planted in a place they didn't belong. I miss them, but they were not transplantable. This one in this photo is one of several in a neighbor's yard. Ken's collected a few of the seed pods and we're going to try to get them to grow. I've read that they will grow from seed, but there's no guarantee you'll get the same plant. That sounds funny, but I think it means that the flower color and/or other characteristics of the original cultivar may not be present in the new plant. If you've followed my blog for while, you know our dog Callie. She's our second dog (Collette died in 2006 after close to fourteen years with us) and she'll be two years old in February. 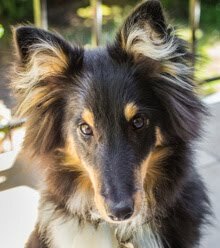 You also know that she's a border collie and has no fear of a little wet weather or puddles. In fact, I think she really enjoys splashing around in mud puddles. Here is the proof. She needs a bath after nearly every walk to rinse the mud and gunk off. My question is this: will she grow out of this or are we in for the long haul? I suspect I already know the answer. We had a brief scare on Saturday morning. The house's heating plant went on the blink. 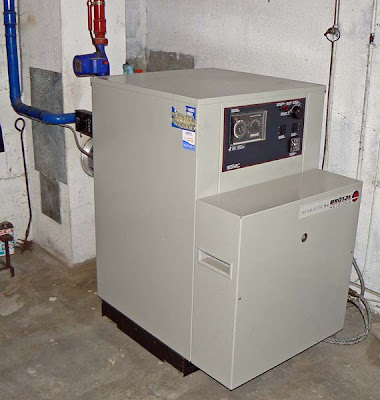 Even though we have a wood stove in the living room that provides plenty of heat in there on winter evenings, the other rooms in the house depend on the chaudière (boiler) to heat up the water that goes to the radiators. The thing in the cellar. We're not really sure how old the chaudière is. The woman who sold us the house thought it might have been around ten years old. That was almost six years ago. It's a German model; a machine only an engineer could love. It takes a bit of effort to figure out how it works. There's a small instruction sheet in German, French, English, and a few other European languages, but it's a bit sketchy on the details. 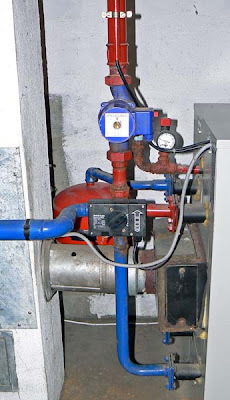 Red pipes = hot water out to radiators. Blue pipes = cool water in from radiators. And pumps and valves and pressure gauges. There are several automated settings and other controls that require an advanced degree in mathematics to figure out. Something about heating curves and climate zones and the ratio of indoor temperature to outdoor temperature. There is no thermostat in the house, but there is a temperature probe outside. Apparently the heater decides how warm to make the radiators inside based on the temperature outside. The control panel. Warp speed, Mr. Sulu! All the other controls help you to help the heater make this determination. You'd think that all of this could be avoided with a simple indoor thermostat. But no. Part of the instruction booklet, in English. After our first winter, we called a company to come and check the thing out, give it a good cleaning, and sweep the chimney. They sold us an annual maintenance contract that includes a total cleaning and servicing once a year in June, and free emergency service should anything go wrong. We called them on Saturday. 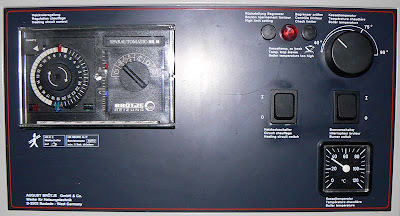 The reset button, lit up (lower left), of our Deltablock Unit (D-U). The boiler kept shutting itself down. A little reset button would light up, I'd press it, and after a few seconds the boiler would fire up, then proceed to shut itself down again. This was not good. 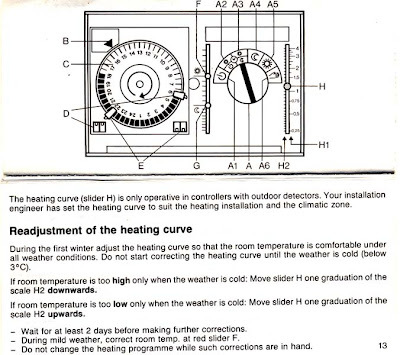 The Heating Curves cheat sheet. I need a cheat sheet to decipher the cheat sheet. The service technician showed up within an hour of our call and took a look inside the chaudière. He figured that some crud (une saleté) had worked itself into the fuel line (did I mention that this is an oil burner?) and was mucking things up. The built-in safety feature (of course) knew something was wrong and shut everything down. The tech guy took the fuel lines apart, cleaned them out, and reassembled them all in about fifteen minutes. And now everything is working fine again! Mr. Fix-it was incredibly polite and efficient, was all smiles, and was really patient with me and my funny accent. When I thanked him, he replied, "On est là pour ça." That's what we're here for. I'm really liking the service contract right now. While walking last week, I heard the strangest sound. It's hard to describe, but it's unlike the usual sounds I hear in the vineyard. Mostly what I hear, besides the wind, are tractor engines, the occasional barking dog (or deer), the braying of a local donkey, birdsong, and distant train whistles. But this sound was different. It was like the sound of someone brushing his hair very quickly, but muffled. 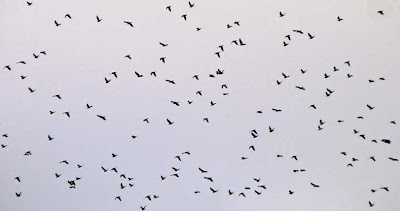 I looked up and saw this very large flock of black birds moving across the sky. I was hearing their wings beating. What a cool sound! I was able to get it together and take one photo of part of the flock. By the time I thought of taking a movie (with sound), they were too far gone. The brown of the winter vineyard can get a bit tiring. But all is not brown. There is a lot of green out there all winter. The grassy plants stay green, and even get greener, all through the season. Not to mention the evergreen trees and shrubs that surround the vines. 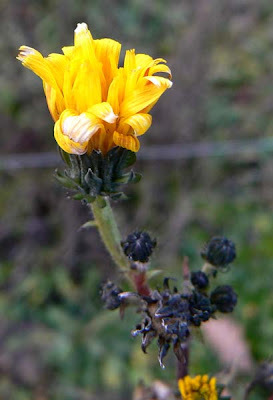 Yellow flowers still managing to bloom in December. But while brown and green are the predominant colors of our winter, there are still spots of livelier color if you know where to look for them. Sometimes you have to look very closely. White qualifies as a color around here. I'm not very patient with the camera when it's cold outdoors (not that I'm that much more patient when it's warm). I seldom lug the tripod along when I'm walking the dog. But I should, because I'd end up with many fewer blurry photos, especially the close-ups. 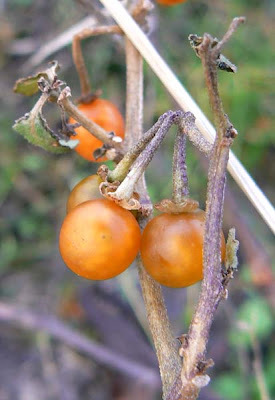 Little orange berries. LOBs pour les intimes. But this isn't work, and I have no obligation other than to myself, and I'm essentially lazy. Most of my energy these days goes to yard maintenance, dog walking, cooking and eating. I occasionally clean the house, too. I've become much more tolerant of dust than I once was. Oh, and the internet. Reading, gawking, searching, and this little blog thing, which is just over three years old now. The harvest ended in early October, but all the grapes were not picked. As we've learned, to get the precious A.O.C. designation, the vintners are only allowed to get so much juice out of each hectare of vineyard. 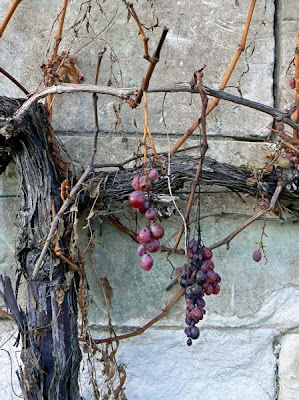 Unharvested grapes against a stone wall. So, before the harvesting starts, they go out and prune some the grapes that don't look so nice. Those fall to the ground and turn to compost; Ken has taken to picking some of them up to make jelly. But even after the harvest, there are some grapes that stay on the vine for one reason or another. Mostly I see them on vines that have been abandoned. Whole sections of vineyard sit out there year after year with no tending, and they start to revert to a kind of wild state. There are many grapes, but they're small and so are the bunches. 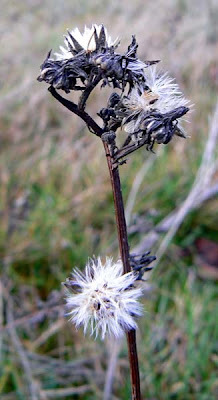 These just wither into raisins and rot and/or they are eaten by the wildlife. 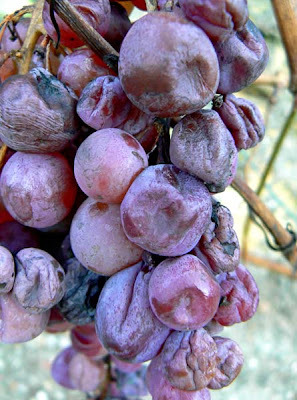 The ignoble demise of a bunch of grapes. There are also some grapes that are planted against the wall of an equipment storage building that don't get picked, except by hungry hikers as they walk by and grab a few tasty bites in late summer. And I can tell you from experience that wine grapes, at least the varietals grown out back (sauvignon blanc, cabernet franc, côt, gamay, pineau d'aunis, and chenin), are quite tasty when ripe! As I said, I took the camera out for the first time in a while on Wednesday during an uncharacteristic break in the clouds. I'm going to milk that moment for my next few posts, so bear with me. Almost sunset, around 4 pm on Wednesday. November and December can be miserable here, weather wise. It's often rainy and windy, which means lots of puddles and mud and a very dirty dog (she gets two showers a day, by the way). We're at 47.3º N, which is about the same latitude as Québec and Seattle in North America. We also have the winter high pressure phenomenon. That means that the weather map can show bright sun, but when we look outside we see that we're completely fogged in. The high pressure traps the morning's condensation on the ground and the sun just isn't strong enough to burn it off. Those are very still, gray days. 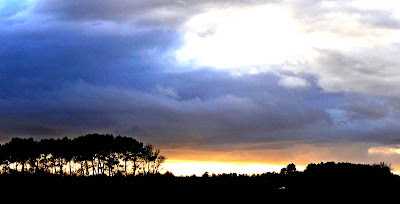 But every once in a while a front pushes through and, like Wednesday, there are breaks in the clouds letting some sun peek in. There are, of course, other days that are just bright and sunny, but they're few and far between in these last two months of the year. It's been a while since the last PPP. Wednesday afternoon brought a little sunshine, so I went out with Callie and the camera. She got muddier than hell, but then there's nothing but water and mud out there right now. Callie waiting at the back gate with a "stick." 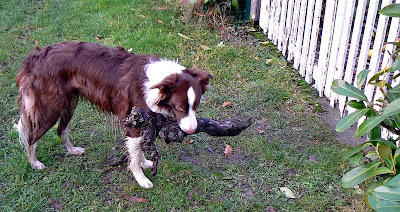 Border collies love to have a job to do, and Callie has determined (with a little encouragement from her humans) that one of her jobs is to bring a stick home from every walk. At first the sticks were kind of normal, but now that she's collected all of those, she's had to find something else. Fortunately, we live in a vineyard. Every fall and winter, the workers pull up dead and dying stumps of old vines and pile them at the end of each row. They're often replaced with healthy vines. Callie will pick up what seems to me to be the heaviest stump she can carry and take it back home. Our yard is littered with dozens of these old vine stumps now. They'll go into the firewood pile this spring. This was the sign above the entrance to one of the the wine houses that we visited with our friends last week. It's in Montlouis on the Loire and it's called François Chidaine. It means "The Unusual Wine Cellar." Not much was unusual about it, though. Except the fact that the wines are grown and made following a combination of organic and mystical practices called "biodynamic" wine making. A bit spooky, it turns out. The wine was good. We started our tasting with a dry sparkling, then a sweeter one. After that there were at least seven whites that we tasted, ranging from the dry to the sweet. Some were single vineyard wines, others were more generalized. All were made from chenin blanc. They were good, but nothing that really knocked our socks off. We went away with about six or seven bottles. You feel like you've gotta buy something when they let you taste all that and they're so nice. As I've said before, our favorite Vouvray wine is from a place called Aubert, and we left there with fifteen bottles. I won't tell you how many are left. Our friends from California, who spent last week here, were in Italy during the week just before. They spent some time in Florence and some time in a smaller town called Pienza. 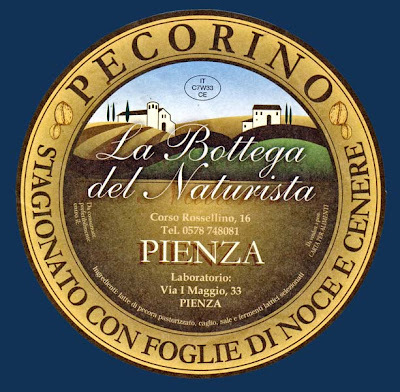 A pecorino cheese label from Pienza, Italy. So when they arrived, they had a bunch of goodies to share! First up was the pecorino cheese. They had enjoyed some fine pecorino and brought back two small ones to eat with us. The first was flavored with black pepper and the second was flavored with truffles. They were great -- the truffle one was my favorite. Ken had stocked us up on French cheeses for their stay, so we had a terrific platter of cheese on the table every day during the week. There was goat's , cow's, and sheep's cheese, something for everybody. 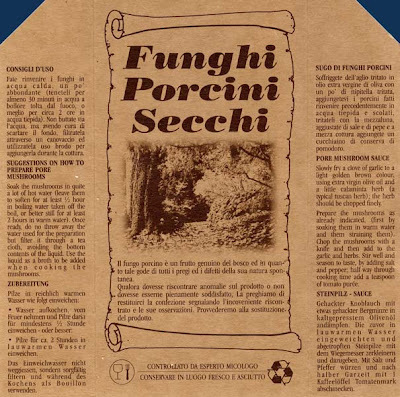 The dried porcini mushroom box. They also brought a package of dried porcini mushrooms. They must have remembered that we like to have dried 'shrooms in the house for cooking. We usually buy mass quantities of dried mushrooms in Paris when we do a run to the Asian supermarket. Porcini are the Italian equivalent of French cèpes, and we're eager to taste them. And last, but not least, is the bag of pasta called pici that they brought. It's long strands of durum semolina, much thicker than spaghetti, and it looks just gorgeous. We're thinking up good ways to sauce it for a meal real soon. Stay tuned!